October 20th, 2015 – Gettysburg PA – From my trailer parked in Maryland just north of Washington DC, I took a day to drive out to Gettysburg National Military Park. 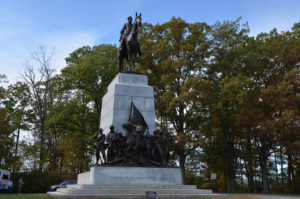 I viewed the film and Cyclorama presentation, then took a bus tour around the battlegrounds, then came back to spend some time in the museum. 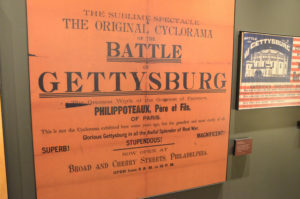 The main admission price is for the Cyclorama/Film presentation which gives context and overview of the events that took place here. The film is recent and well done. 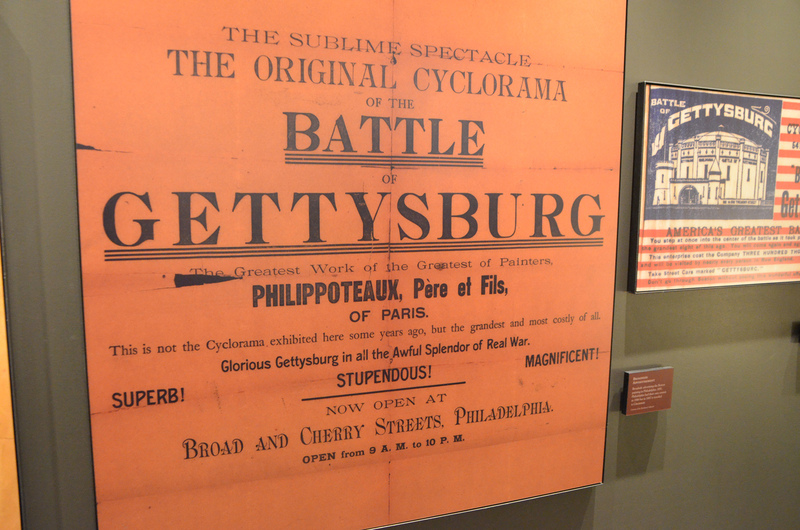 The Cyclorama has been recently refurbished but is a huge oil on canvas painting that was done in the 1800’s. 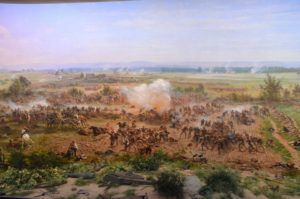 With dramatic lighting they highlight various parts of the painting as they tell the story of the battle. The admission also covers entrance into a very well done museum which goes into much more detail with both static displays and short films. 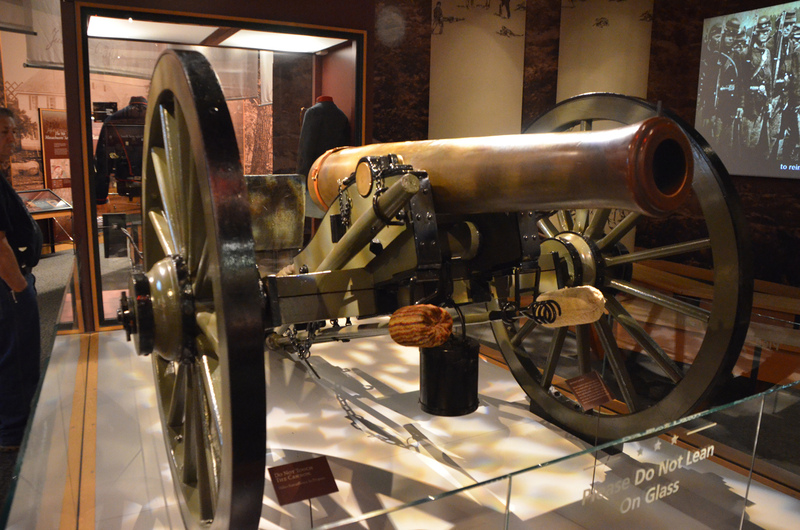 Photography is allowed, so I have included a few shots from both the Cyclorama and the Museum. The battlefield tour was well worth the money and time. Having had the overview already it made a lot more sense when we drove down the Confederate lines and back up the Union lines. As our guide said the land around here is “like a Ruffles potato chip” with undulating ridges side by side. In this era of warfare these low rises were sufficient to provide cover of movements. Weapons were mostly direct fire, and those that weren’t like mortars required someone to correct the fire visually. It took a while for me to really sense the “ridges”, they are pretty low by west coast standards, but as we moved along and he pointed out the other side’s positions from each battle line it became much more obvious. 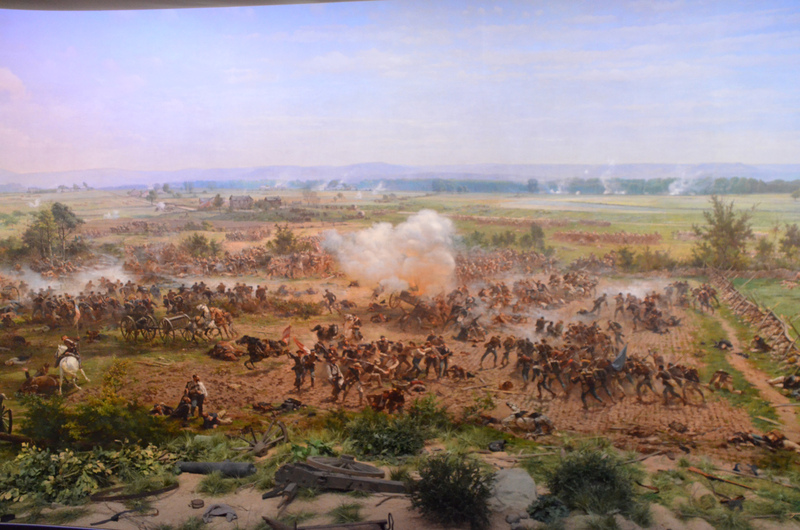 An elaborate painting with a bit of real exhibit in front of it, the cyclorama surrounds the viewing platform on all sides. The audience enters the center of the exhibit via a stair from below. The presentation is recorded and includes changing lighting to highlight corresonding parts of the painting. It appeared that some of the lighting might be from behind the canvas. John Burns, the only civilian to take up arms. The parks department is working to restore the countryside to how it would have looked historically. Cannons were collected after the war, carriages were destroyed. But many were put back out for display and new carriages built to hold them. 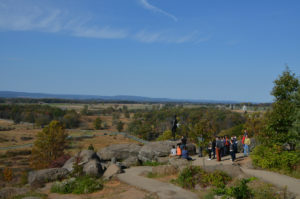 The back of Little Round Top from inside the bus. 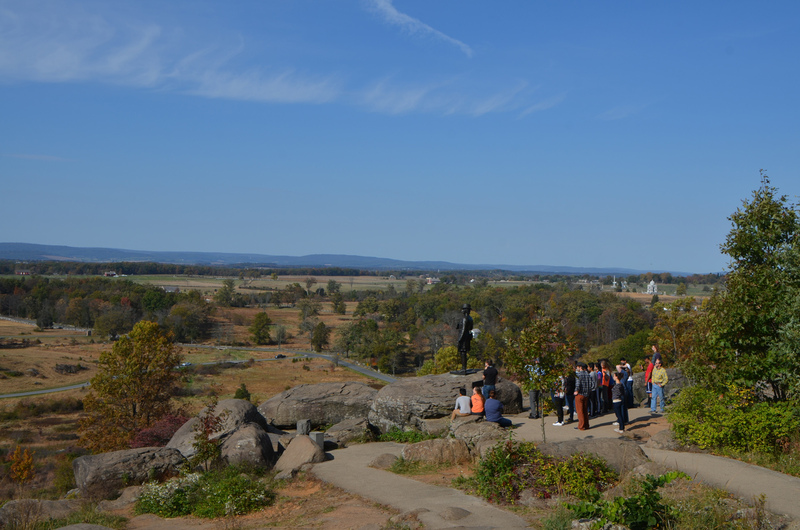 Our tour guide at Little Round Top. These rock walls were as far as the Southern soldiers made it before retreating. Found on the battlefield, two bullets that collided mid-air and fused.